It really can be as easy as this next My Obstacle Course station activity that I am going to tell you about! When Andrew goes to speech, we usually get a sheet of words, mostly with pictures, to take home to practice. 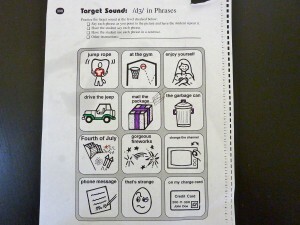 Speech practice sheet targeting what Andrew calls the d3 sounds (aka /j/ sound). My apologies to the maker of this sheet but as it is, it is not very exciting and I found it difficult to motivate my child to want to practice this at home as is. 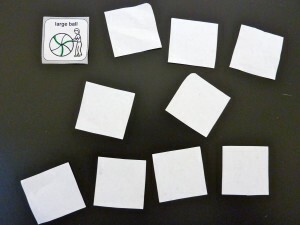 I know this can be much more fun without a great deal of effort and so I decided to just cut apart the pictures and turn it more into a game to see if that made a difference. 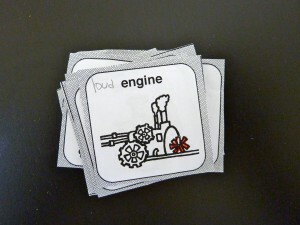 Words and pictures cut apart to create cards. 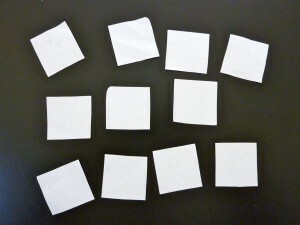 These cards can be saved, mixed and matched for reinforcement purposes. 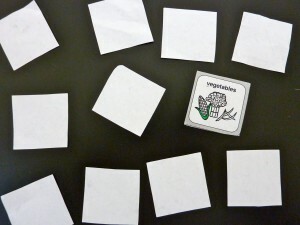 One station activity was simply turning them over and having him choose one to flip and say 5 times. Cards flipped over for him to choose. Flip and say 5 times. Continue until all cards have been practiced. This could be combined with the carpet runner to create a “Say and Crawl” station. He could flip a card say it 5 times, crawl down the runner and place it into a cup/bowl/bucket/whatever! Another station activity we’ve done with putting the pictures into a cup, having him reach in, choose one and say it 5 times. He even turned this activity into more of a game by finding a place to hide the picture after he was done saying it. I did not mind this one bit because he came running back to pick a new word to say so he could hide another one. Any time I can get him excited about practicing something that he struggles with is something that I get excited about, especially when it is as simple and basic as this!! Note: If your child’s attention span or frustration level can only handle less, choose an amount that works for them and spread it out.